channel keys : Imitate the real TV remote setting to swift different channels by up and down key . Baby can experience the reality during imitation . weather keys : Include different weather phenomena such as cloud, sun,rain,fog and snow .The abundant voices and recognition can teach baby knowledge in playing . Play/stop keys :Learn the shapes of square and triangle with red remote controller sounds. 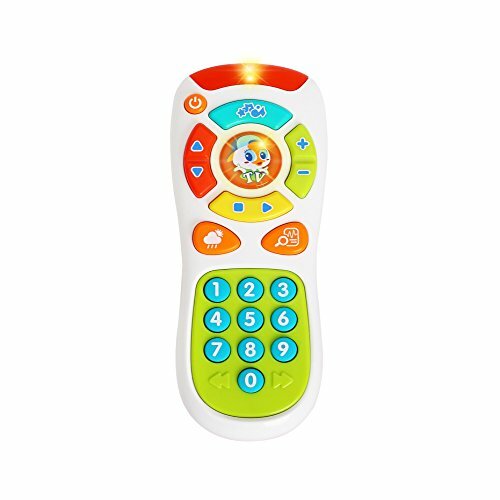 Your child can enjoy imitative fun while learning numbers, colors, and shapes with a TV remote control toy that looks just like mom and dad’s! 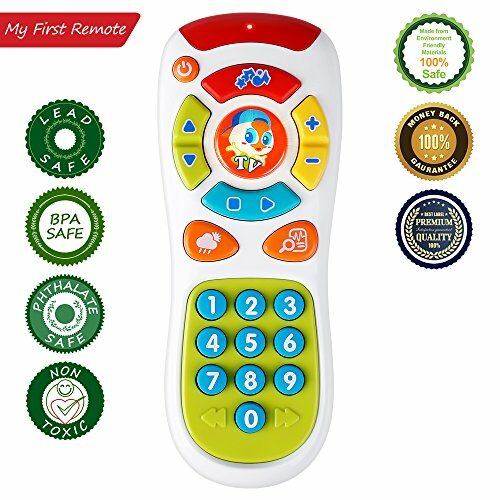 This toy remote lets your child surf through nine different channels that include pretend news and weather for role-play fun. Volume and channel control buttons teach the concept of opposites. Plus, familiar phrases like “Breaking News” offer a playful real-life experience on imitative play. 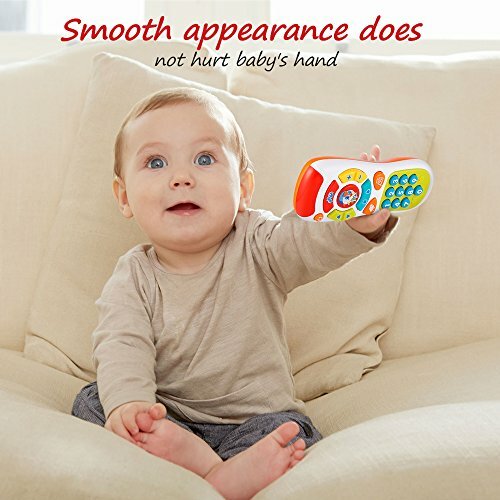 It clicks with baby’s development. Pressing buttons helps give motor skills a fun workout. The realistic styling and light-up screen inspire early role play fun. And the lights, fun music, phrases and bright colors help strengthen important senses like sight and hearing! 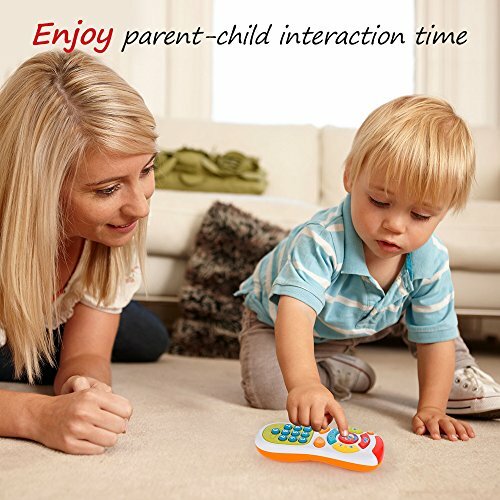 Put little ones in ‘control’ with their very own learning remote! Helps give baby’s fine motor skills a “push” in the right direction. 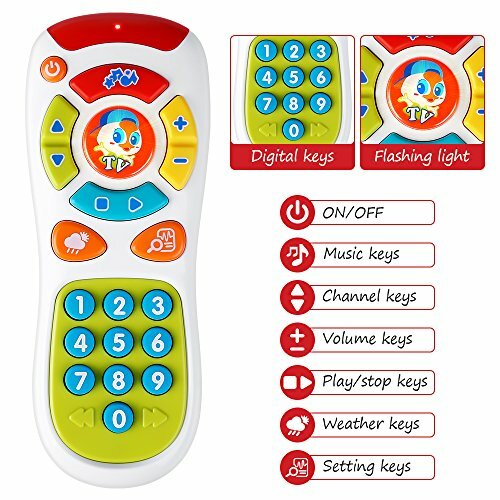 TV remote toy is for children 6 months to 3 years old;Best gift for around 1 year old boy girl. 2 AAA batteries are not included. Insert and use batteries correctly under adult supervision . Baby like to get the TV remote or cellphone from parents . 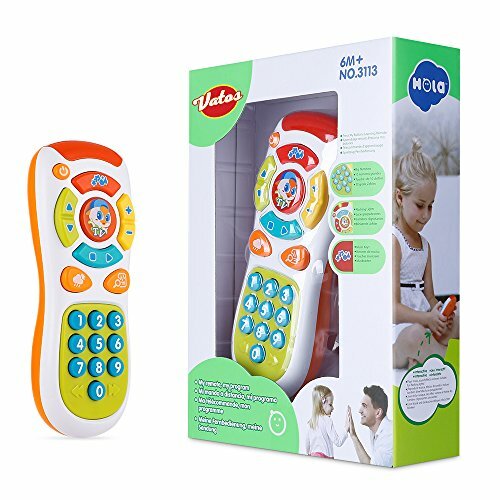 Toddlers can pretend channel surf through these channels including weather and news; interactive role play for an early education toy .Fun for kids , Easy for parents. Colorful buttons introduce colors, numbers to keep your child’s attention. Learning remote helps baby discover cause & effect, develop his cognitive and thinking ability.